Last Monday I landed in Harrisburg, PA for a two week business trip in New Holland, PA. 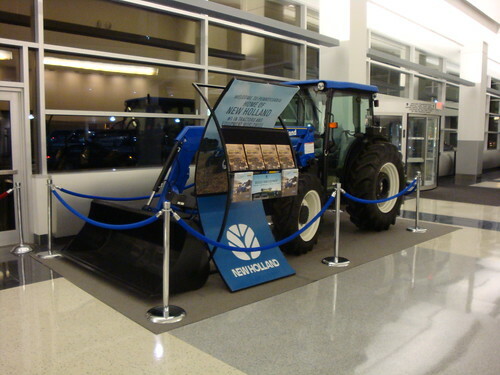 The baggage claim area had a display of a Hummer, a Cadillac, and yes a New Holland Tractor…I found this hilarious! I picked up my rental car, a 2009 Chevy Cobalt LT…awesome! Actually, it is a pretty decent car, but I’ll get into that later. I have spent the last week weaving in and out of Amish horse and buggies, seriously they are everywhere, to and from the Case New Holland Technical Center, where I have been cramming 6 months of training into 2 weeks. At this point I could go into details about my training but it is only interesting to me. Now I just have to stave off boredom for the weekend. This entry was posted on May 10, 2009 at 12:07 am and is filed under Rants, Work. You can follow any responses to this entry through the RSS 2.0 feed. You can leave a response, or trackback from your own site.